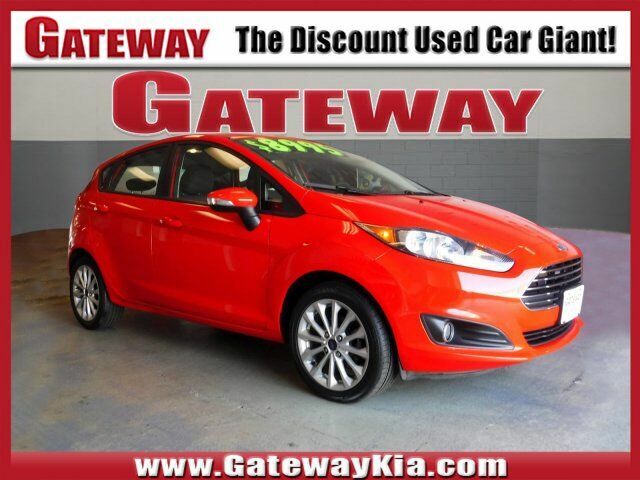 * With its bright hues like Green Envy and Molten Orange, the 2014 Ford Fiesta is highly capable and a joy to drive. It achieves up to 34 MPG City and 43 MPG Highway. The available Ford SYNC system lets you make hands-free calls, stream music from a compatible phone via Bluetooth, and hear turn-by-turn directions through your speakers. The Fiesta delivers 120 horsepower of fun from its 1.6-Liter I-4 engine, or an intense rush when behind the wheel of the All-new Fiesta ST with its 197 horsepower turbocharged engine. Twin independent variable camshaft timing (Ti-VCT) adds an extra measure of precision, improving fuel efficiency and power output. For that extra-connected feel, the PowerShift 6-speed automatic transmission can provide torque to the wheels 100 percent of the time during shifts. The electric power-assisted steering gives compensation for pulling and drifting. To help Fiesta stay sure-footed and firmly planted in the corners, a MacPherson-strut front suspension features specially tuned dampers, spring rates and bushings, and a 22-mm stabilizer bar. Check out stylish options like Charcoal Black Leather-trimmed seats with Molten Orange Cloth Accents. On the ST trim get the available RECARO seats, which hold you in place during intense drives with their supportive bolsters. There are also available features like heated front seats and ambient lighting with 7 different hues. For space, Fiesta's 60/40 split rear seat folds down, opening up additional room for your gear. Pass-through access from the trunk increases usable space in the sedan. The Fiesta won "Top Safety Pick" - the highest possible rating from the Insurance Institute for Highway Safety (IIHS) - 3 years in a row (2011-2013). Underneath its aerodynamic shape, an ultra-high-strength boron safety cage protects you and your passengers. In addition, the AdvanceTrac electronic stability control helps keep all 4 wheels securely on the road. Get yours today and go further with the 2014 Fiesta. Source: The Manufacturer Summary*Price (s) include (s) all costs to be paid by a consumer except for licensing cost, registration fees, taxes, and documentation fee. Because errors may occur, please contact us before purchasing to verify options, incentives, discount offers and availability. Factory rebates subject to change without notice. Not responsible for errors or omissions.